I usually try to be impartial on the website but this time I feel the need to tell people my personal views. On Wednesday 14 October at 7pm at Springfield Campus, Corsham, there is to be a public meeting to consider the proposal to transfer Rudloe, Wadswick and Chapel Plaister (marked yellow on the attached map) out of Box to Corsham Council. 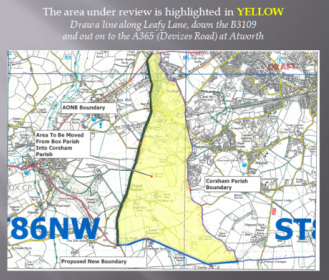 The area marked yellow reflects the are involved in the proposal. One argument is that Corsham is the natural area for people of Rudloe, Wadswick and Chapel Plaister to shop. It is true that many Box people do some shopping in Corsham but it makes no sense to use it as the defining argument. People shop where there are facilities; for example, clothes from Marks & Spencer in Bath, catch the train from Chippenham, buy chocolates from Aldi in Melksham, and buy computer needs on-line. This doesn't make us residents of Bath, Chippenham, Melksham or aliens from outer space. Where we belong is much more complicated than that. In many senses belonging is about historic continuity, where we were born and bred, and about the inherited memory of the history of the area we live in. Rudloe, Wadswick and Chapel Plaister are some of the earliest hamlets named in the parish of Box with a continuous, unbroken connection of over 800 years. In the reign of Henry III (1216-1272) Bartholomew Bigod granted the rectory and tithes of Box and Ryddlow to Monkton Farleigh Priory. The first recorded reference to Wadswick was to Wadeswica in a charter in the British Museum from the 1100s. Chapel Plaister was first referred to as Pleystede in 1268. All of these references identify the areas as part of Box. The name of Rudloe was Riglawe for centuries, until about 1713 when it was changed to Rudlow. Chapel Plaister was closely identified with Hazelbury in 1340 when the Bishop of Sarum granted to William de Rysindon, Rector of Hazelbury, a licence for preaching in the Chapel of Pleistede in his parish of Hazelbury. The death of Captain John Hanning Speke, the African explorer who discovered Lake Nyasa, source of the White Nile, reminds us that the Spekes were the lords of the manor of Box for centuries. These areas are like many of the other hamlets in Box (including Ditteridge, Ashley and Kingsdown) which are proud of their local community as well as pleased to be part of Box's rich history. What Has Box Done for Rudloe, Wadswick and Chapel Plaister? In 1600 and 1700s the ratepayers of Box supported the destitute and needy of these areas with outdoor relief and work schemes. They did so because the residents of these areas were their neighbours, compatriots and friends. The cost of that would now amount to millions of pounds - is Corsham planning to reimburse Box on any transfer? This closeness was repeated more strongly at times of war. There are nine servicemen from the Rudloe, Wadswick and Chapel Plaister areas who lost their lives in World War 1. Their names are recorded on the Box War Memorial and their families and those of returning soldiers from these areas were supported by Box's Comrades Legion Club after the war. Many died fighting with their Box Comrades in Pals groups. The same is true of survivors of World War 2, some of whom are still alive. People of Box are proud to have Rudloe, Wadswick and Chapel Plaister as part of their story. For centuries people from these areas have been buried in Box Church and Cemetery and are part of Box's story. This closeness was true when Box Revels (of which I was part) organised the play Totterdown Tanzi to be performed at Springfield Community Centre in 1988 and for Rudloe Village Green, a community promenade play involving more than 200 Rudloe people. Where you belong should not be determined by short-term financial and political whims at an opportunistic moment. That attitude produced Avon Council, BANES and gave Box the post code of SN (Swindon). If you care about these issues please attend the public meeting at 7pm on 14 October at Springfield Campus, Beechfield Road, Corsham. Whether you agree with my views or disagree, it will be a done deal if we don't make our views plain by attending. If you can't attend please give me your comments via the website contact page or facebook page or pass them on to another person to express at the meeting. If we don't speak out Box will forever be diminished. There is a reference in the Pipe Rolls of 1167 spelling the name as Riglega.